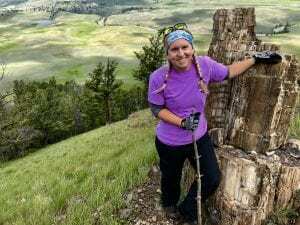 Undergraduate student Hallie Bruce first became interested in Petrology during the spring 2018 semester while taking GEOL 503, taught by Dr. Kempton. In class, she learned more about magmatic and metamorphic processes through careful petrographic investigation and long hours observing thin sections through a petrographic microscope. It was then that she started to become more interested in economic geology and using petrology to understand the formation of ore-deposits, and during summer 2018, she decided to do a research project with Dr. Lacroix on the topic. 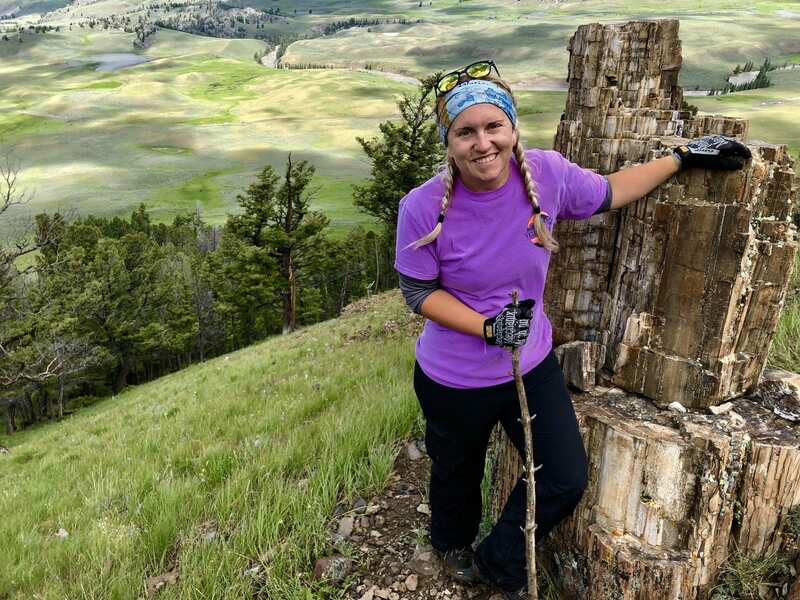 As a result of her summer research experience, she has decided to work toward a senior thesis that will focus on one aspect of ore deposit petrology: fluid inclusions. Fluid inclusions are microscopic bubbles of liquid and gas trapped within a crystal or mineral. They also correspond to trapped remnants of the fluids that formed hydrothermal mineral deposits and provide a unique insight into the chemical and physical conditions of ore forming fluids. A way to study fluid inclusions is through micro-thermometric analysis, which studies the phase transition (gas à liquid, solid à liquid, etc..) in a fluid inclusion by increasing and decreasing temperature. Such analyses require a microscope that has been fitted with a fluid inclusion heating – cooling stage. Dr. Lacroix established this new capability at K-State shortly after he joined the department in 2015. The fluid inclusion facility is located in the department’s recently refurbished Fluid Inclusion – Reflected Light – Raman Microscopy Lab. Fluid inclusion data are crucial to understanding ore-deposition in gold systems, because it allows researchers to qualitatively estimate the liquid and gaseous phases present during Au-deposition as well as quantify the pressure and temperature conditions of inclusion entrapment. Currently Hallie is working on a project in collaboration with an exploration company that involves quartz-tourmaline mineralized veins from an orogenic Au-deposit. This project is in the Bay-James area (Canada). The company is excited about the results, because they could offer a way to better understand the mineralized fluid and to compare it with world class deposits, aiding exploration. The first results show the targeted deposits are characterized by a CO2-H2O fluid system where primary fluid inclusions (associated with the ore) are CO2 pure and/or H2O-CO2 fluid inclusions. The first Raman analysis also showed evidence of N2 and CH4 as volatile gases. Such fluid system suggests that gold formed during the fluid immiscibility forming aqueous fluid and CO2-rich volatiles, which is characteristics of orogenic Au-system worldwide. These data were greatly appreciated by the exploration company because of the importance of the project. The next step will be to run more rigorous Raman analysis and to quantify the exact pressure-temperature condition of the Au-mineralization. Hallie plans on presenting this data at the regional GSA conference in 2019, and plan on continuing in this direction for her graduate thesis.